“Know the secret name of something and you control it,” is an extremely ancient idea, stretching as far back as the Sumerians, and running through subsequent Mesopotamian, Egyptian and Greco-Roman magic. The secrecy of the name was critical to its power, and to the mystique of those who knew it. One suspects it also helped their hourly rates. It’s modern equivalent is the “unique identifier.” Information is available as never before, but its sheer quantity limits discovery. Unique identifiers cut through the clutter. And they can be powerful. Let the wrong person know your Social Security Number and you’ll be in a world of hurt as great as a malevolent spirit caught by a name under a Babylonian demon bowl. In the legal world the equivalent is the West American Digest System, which numbers court cases for lawyers. Although the cases are invariably in the public domain, the numbers that identify them are not. And controlling “the only recognized legal taxonomy” gives its creator, West Publishing, a valuable monopoly. In the book world, it’s the ISBN. Know a book’s title and you can find yourself away in a sea of editions. Discover its ISBN and you’ve got it for sure. Type the ISBN into BookFinder or Abebooks.com and you’ve a panoply of new and used sellers. The IP claim is hogwash. ISBNs are facts. Under US law facts can’t be copyrighted. The Coop is probably within its rights to expel whomever it wants, bhat won’t stop people from trying. The three students above were volunteers for a site called CrimsonReading.org, which is compiling a complete list of all books used at Harvard. When a Harvard Student types in an ISBN, CrimsonReading connects them to new and used booksellers. Affiliate revenues go to charity. By calling on volunteers and getting Harvard professors involved, CrimsonReading is getting around the Coop’s magical secrecy. Three cheers to them for doing it. We need more projects like CrimsonReading. Much the same idea was behind my Google Book Search Search bookmarklet, which asked volunteers to collect Google Book Search IDs. In this case, the unique identifier was new and more secret. By giving its scans unique—and effectively secret—numbers, Google is creating a whole new bibliographic identification scheme. And where ISBNs cover only about thirty years of books, Google’s IDs are designed to cover every book printed, including millions in the public domain. Control the name and you control the thing. It’s what WestLaw is doing. It’s what’s what the Coop is trying to do. Is it what Google is doing? I’m not sure. And I don’t see any signs of this happening on its own yet. For example, sellers on used book sites are not using Google Book IDs to nail down editions. But the danger is there. Secret and proprietary numbering systems pose a serious challenge to the benign potential of the internet. When the secrecy or obscurity are used against this potential, people need to act up—and break the spell. *Always pronounced “coop,” not “coöp.” Full disclosure: My parents belong to the Coop, which is a true “cooperative” in organization. This means they share in the annual dividend accord to how much they spend there. So I’m working against them! 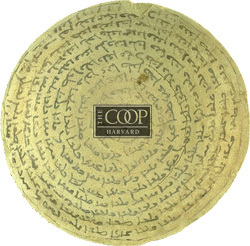 **I grew up near Harvard Square, and the Coop was one of my haunts. (It’s a general-purpose bookstore as well.) Quite a few of my friends were expelled from the Coop for shoplifting. If CrimsonReading really wants to get the job done, it should enroll the private-school street urchins of Square in the ISBN game.